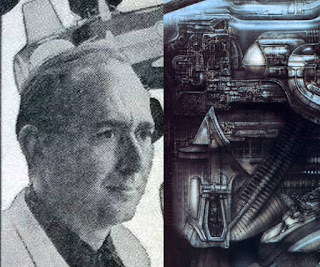 Exploring the "Alien" Movies and HR Giger. 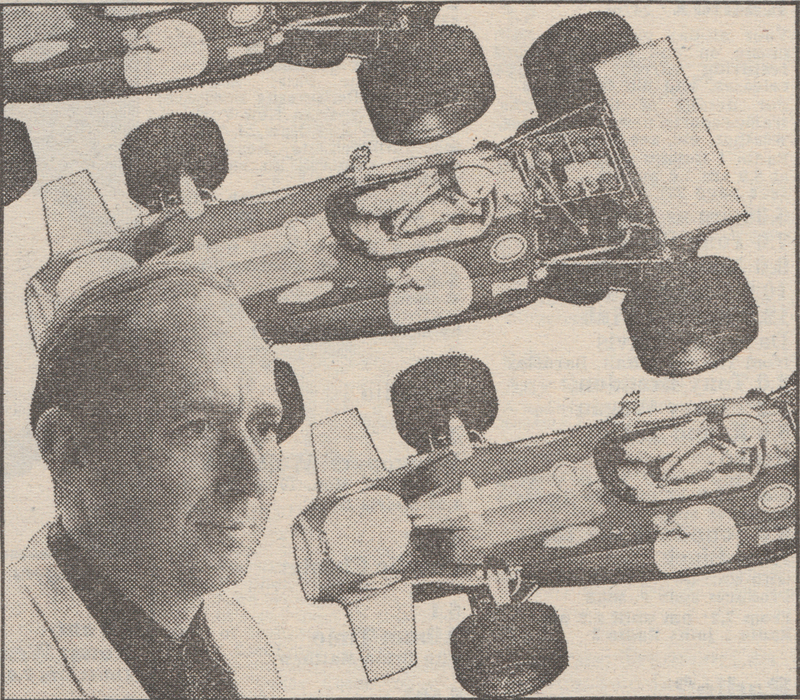 All entries are continuously edited and altered. Articles are published not by actual date. 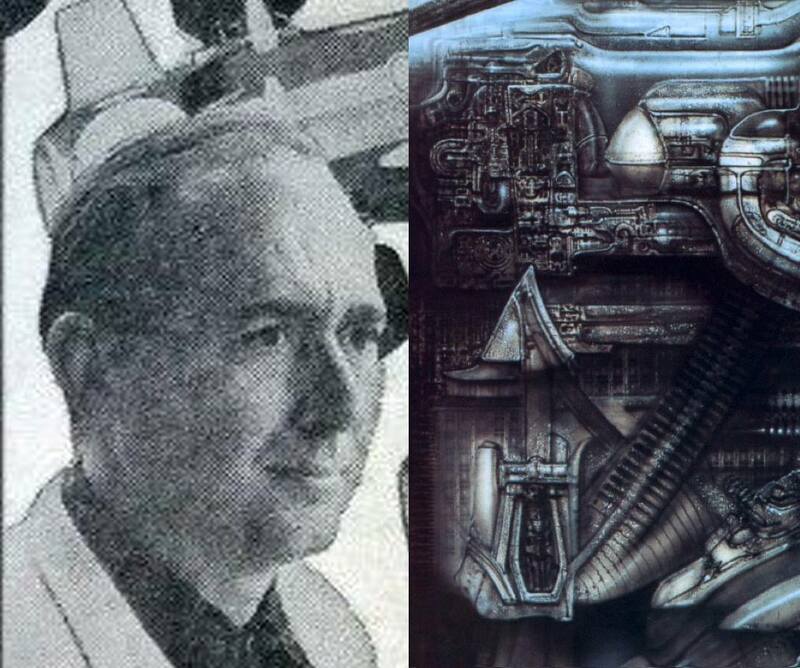 a) 8th of March 2017, the realisation this evening that the Giger painting New York City XIV Factory seems to reference the Radio times image of JG Ballard with racing cars from a February 6th to 12th 1971 edition of the Radio Times. The idea is that during the time that Giger was in England in 1978, perhaps through a conversation he was made aware of image in the magazine to do with the Crash documentary that was broadcast on BBC TV in 1971 directed by Harley Cokeliss, and so got hold of the photographic illustration from the magazine, and in 1980 decided to use elements of it for New York City XIV Factory in 1981. 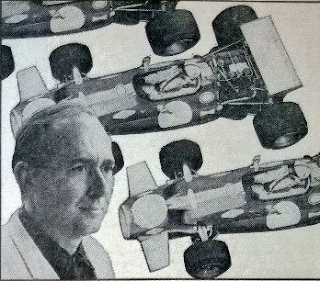 New York City XIV Factory in 1981.
illustration from February 6th to 12th 1971 edition of the Radio Times. 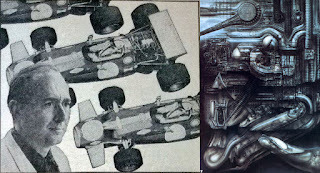 b) The racing car has been abstracted somewhat, becoming an elongated form sloping from the right down the left. 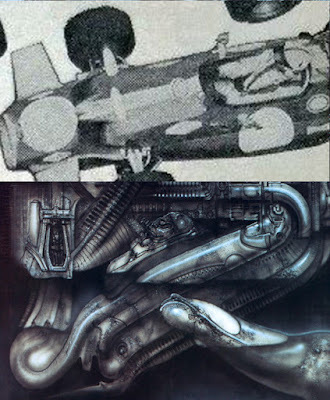 The front starboard fin has become bent with vertical patterns. The pale oval on the lower right of the racing car has been incorporated into the tip of the phallic form on the lower right of Giger's paintings. c) The oval shape with a nearby oval seems near enough. d) For a third element in common, although I might have to settle for the line of the collar of the jack starting at the back of the neck. 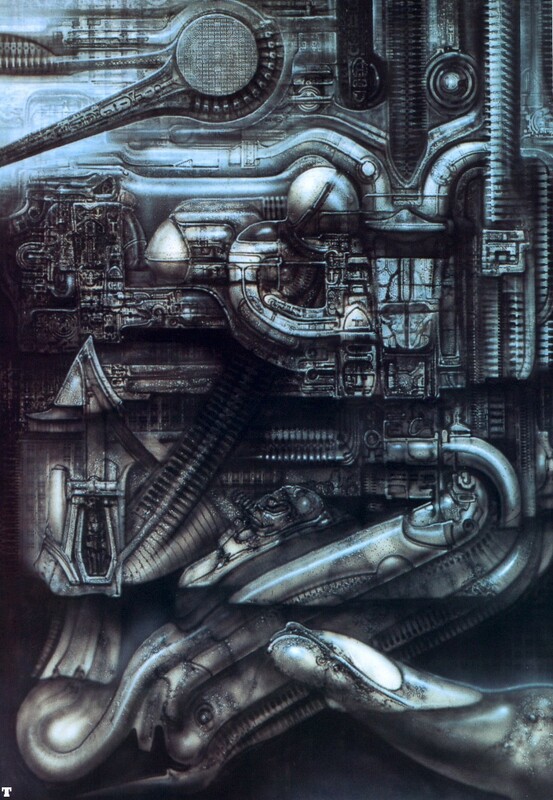 In Giger's painting there seems to be a bent triangular form on the left and the line continues to slope down from its right. Or the triangle represents an abstracted nose and the line slanting down to the right from there is a nose line and the very simplified version of the face can only be guessed at. If it is supposed to be JG Ballard in the painting, he made no attempt to make it recognisable. The starboard front fin of the lower racing has become part of his collar and the front of the racing car in the middle of the picture with the front behind the top of his head seems to have become part of his had in the painting. 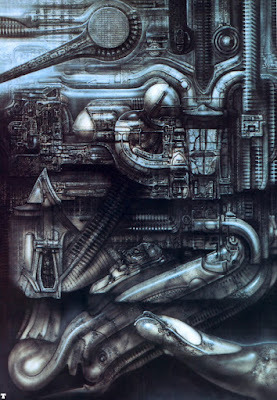 Another picture or two of some sort that would have been referenced might help to make more sense of this Giger painting.